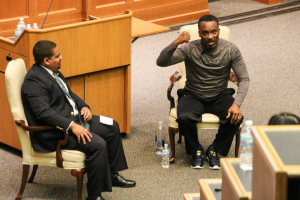 A symposium on Friday at Notre Dame Law School explored the growing international impact of sports with presentations by speakers, students, and former Fighting Irish football star Raghib “Rocket” Ismail, ’94 B.A. The Notre Dame Journal of International & Comparative Law organized the event – named “From Courts of Sport to Courts of Justice: The Impact of International Sports on Individuals, Society, and the World” – with help from several sponsors. “This isn’t just a journal event. This isn’t just a Law School event. This is a Notre Dame event,” the symposium’s chairman Jim Schwabe, 3L, said at the beginning of the event. Michael Mercurio, 3L, editor-in-chief of the Journal of International & Comparative Law, said the goal was to organize a one-of-a-kind symposium that combined sports law, international law, and human rights in a way that would appeal to law students and people outside the Law School. “We thought it was fitting considering Notre Dame’s tradition of excellence in sports and global human rights, and we have incredible alumni who work in the sports industry,” Mercurio said. The presentations by academics covered topics such as the role that hockey played in the Cold War, advocating before the international Court of Arbitration for Sport, and the Vatican’s view on sport at the service of humanity. Current students at the Law School talked about their research on the human cost of the Summer Olympic Games in Rio de Janeiro, the employment of forced labor related to the FIFA World Cup, the treatment of women athletes, and the impact that Britain’s withdrawal from the European Union could have on the English Premier League. One session focused on entering the sports and entertainment industry and featured a panel of three Notre Dame alumni: Ndidi Massay, ’93 J.D., chairperson of the New York State Athletic Commission; Matt Nussbaum, ’00 B.A., ’04 J.D., assistant general counsel for the Major League Baseball Players Association; and Kevin R. Schulz, ’96 B.A., a partner with Foley & Lardner LLP and vice chair of the law firm’s sports industry team. The symposium closed with a question-and-answer session with Ismail in the Patrick F. McCartan Courtroom. Ismail, a kick returner and wide receiver, was an electrifying part of Notre Dame’s dominating football teams in 1988, 1989, and 1990. After leaving Notre Dame, he signed a four-year contract worth a then-unprecedented $18.2 million with the Toronto Argonauts of the Canadian Football League. Ismail talked about the difficulty of navigating the flurry of business decisions that an athlete needs to make when transitioning from college to professional sports. If he could go through that experience again, he said, he would tap into Notre Dame’s alumni network for more guidance. When asked if he had any advice for lawyers who aspire to be sports agents, Ismail said they can set themselves apart by developing a track record of trustworthiness. The Nanovic Institute for European Studies, the Helen Kellogg Institute for International Studies, Foley & Lardner LLP, the Center for Civil and Human Rights, the Notre Dame Sports, Communications, and Entertainment Law Forum, the Notre Dame Career Development Office, and the MBA Sports Business Club sponsored the symposium. Originally published by Amanda Gray at law.nd.edu on March 28, 2017.